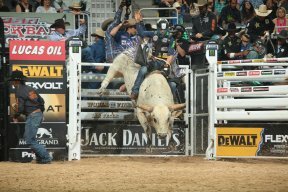 Bull riding is a way of life for Brazilian native Luis Blanco, who began riding at the tender age of 12 after being inspired by his cousins. As a real life cowboy, Blanco, who resides in Texas, is prepping himself to compete against 35 of the top bull riders around the world this weekend at the PBR Competition at the Allstate Arena. Blanco spoke with Lawndale Bilingual News about how he mentally preps before each evet and what it takes to become a successful bull rider. Lawndale Bilingual News: PBR is coming to Chicago this weekend for a three-day event. What are you looking forward to the most and how do you mentally prepare prior to each show? Luis Blanco: To prepare for an event, it’s 20 percent physical, 30 percent emotional and 50 percent mental concentration. I work out and review videos of the rides to get to know the bulls a bit better. Bull riding runs in your blood. Do you remember the first moment you fell in love with the sport? The first time I went to a bull riding event, I went with my parents. I wasn’t riding, yet. I was very young, but I imagined it being me and never stopped thinking about it ever since. I knew I wanted to do that the rest of my life. What does bull riding mean to you? Being a bull rider is the only way that I could ever accomplish my dreams. Having the life that I had always wanted was almost impossible in the small town that I come from. Dreaming of riding bulls away from home was a challenge never the less getting to do it for a living and in different countries. You have achieved quite a lot in your early age, what do you attribute your success to? To my dedication, never stop trying my hardest and getting up every time I’m down. What do you hope people take away from PBR shows this weekend? I want people to like what they see, the best bulls and the best riders in the world. I am a bull rider and there are events when I get home and I’m still impacted by the magnitude of this great organization PBR. What advice would you give to the Latino youth who aspire to be like you? Before anything, think about all the things that come with being a bull rider. You will get hurt, it’s not about if you get hurt but how bad it’ll be. Always away from family, many people with criticize you. There will be times you might not have money. After taking all of that into consideration, if it’s still what you want to do. Do it, but with all your heart because it’ll be the only way to accomplish your goal. The PBR Built Ford Tough Series will be in town at the Allstate Arena this weekend for a three-day event. For ticket and/or schedule information, visit www.pbr.com or www.Ticketmaster.com.